Out of the formality that was the Coliseum extension news on Tuesday was a related item that got Oakland fans all excited and hopeful. Lew Wolff, in full photo op mode with the various assembled pols, mentioned that he was working with an architect on a ballpark design at the Coliseum. Wolff gave few specifics, other than saying that “several design ideas” were being considered. Wolff declined to say much else, or even identify the architecture firm he’s working with. The general sense of astonishment I saw in articles and social media feedback, and in Damon Bruce’s lighthearted take on it on his radio show yesterday, confirmed yet again the fact that the average fan is not going to be bothered to keep up with much of the news. Not that they should be expected to, this is a fairly boring subject at the planning and political stage, and has niche value once shovels hit dirt. Still, fans called in and mused with great hope about one feature or another being integrated into a new ballpark at the Coliseum. But it seemed as if they weren’t going to believe in Wolff’s overtures until he uttered those magic words, I’m working with an architect. My goodness, an architect! Fiddle-dee-dee! Of course, those who have been following this stadium saga for some time probably already know that Wolff has been working with a prominent architecture firm for nearly a decade. That firm is 360 Architecture, a company that had roots in HOK and created an offshoot, Heinlein Schrock Stearns, before merging with another to become 360 in 2004. They opened an office in San Francisco in the fall of 2005, as the Coliseum North plan transformed into Fremont’s Pacific Commons. Later they worked up plans for the Diridon site and the soccer stadium near San Jose Airport. And if you read SVBJ scribe Nate Donato-Weinstein’s interview with 360 principal Brad Schrock from Tuesday, you might’ve picked up a hint of what was happening next. Donato-Weinstein: What’s your dream project? Schrock: We’ve been working with the A’s for such a long time. I’d love to do a ballpark for the A’s. I’d love to do one in San Jose or Oakland. The A’s are just such an interesting franchise. Trying to craft a facility that meets their mojo is a lot of fun. The other one I would die to be involved in is if the city of LA ever gets an NFL team. That would be phenomenal to work on. While there are no major league ballparks under Schrock’s new shingle, his firm is responsible for the lovely Huntington Park, which I visited a few weeks ago. During his Heinlein Schrock Stearns days he was responsible for Safeco Field, which to me is #1 or #2 in the bigs. 360 is more well known for arenas than stadia, having designed Sprint Center in KC, but with most arenas being early in their lifespans, the firm has done outdoor venues. They cut their NFL teeth on MetLife Stadium, whose soullessness is not 360’s fault but rather the design-by-committee, tug-of-war conducted by the Giants and Jets. Now they’re working an an incredibly ambitious project, the new Atlanta Falcons Stadium. They also have the upcoming Rogers Place in Edmonton under construction, and the Earthquakes Stadium, which is set to open next year. Some of the plans under consideration in Fremont included a truly retro design featuring columns, similar to legacy ballparks Wrigley Field and Fenway Park. Partly motivated by cost savings and a desire for better sightlines, the concept didn’t appear to go far thanks to the stigma held by obstructed view seats. Assuming that column-free, minimal-cantilever is the chosen path, I think there are some very important positive lessons than can be taken from being stuck at the Coliseum – not just the Coliseum of yesteryear, but the current tarped-off, Mt. Davis-eyesore version. One of those lessons has to do with the noise level. Sure, the expansive foul territory makes the seats down the lines terribly far away from the action. The activity of the crowd, which is good even on 15k nights, makes up for the lack of line-hugging seats. Yet there’s one other thing that contributes to the noise factor, and it only really started when the tarps were installed in 2006. Simply put, about 90% of the Coliseum’s seats (in current baseball configuration) are lower than 60 feet above the field. That’s about 32,000 seats. That vertical conservation concentrates crowd noise to a degree not known since old Comiskey and Tiger Stadium were still around. That’s why today’s MLB players are so taken aback when they come into the Coliseum, because despite the old girl’s decrepitude, it’s uncommonly loud. Why? Just look at how ballparks are constructed these days. It’s easy to point to levels of suites, and yes they are largely responsible, but there are also regulatory standards that come into play. On the lower concourse, wheelchair rows need to be 30-36 inches above the row in front of them for proper compliance. That height grows the higher you go. Plus architects have their own guidelines to prevent people in the back rows from having their views clipped by an overhang, which happens in the back rows of both the Field and Plaza levels at the Coli. In new ballparks, especially those that follow the familiar HOK blueprint, you have a lower deck of about 30-40 rows, then the elevated wheelchair row merged with the concourse, then decent height so standees can properly see the action. Then there are club and suite levels in different configurations. Finally there’s the upper deck, which these days is split into two decks. When you look at a cross section of a ballpark, it’s easy to identify 4 or 5 separate seating levels, all the better for the teams to separate those levels by price. Coors Field, which is similar to AT&T Park. Top row is 105 feet above field. Take Coors Field, which is pretty much the standard bearer among the modern, HOK/Populous breed. Lower deck, Club level, Suite level, Upper deck. It’s a big building that was downsized before the start of the season. That’s good, but it won’t fix the sightline problem. The top row is 105 feet above the field, which makes the action truly look like it’s a Mile High. Add to that the limited cantilevering and it’s pretty far from the action, nearly 235 feet from home plate to that back row in the upper deck. Could be worse, though. Mt. Davis’s top row at the 50-yard line is 335 feet from the near sideline. That’s longer than a home run in the LF/RF corners. Now look at this cross-section, which somewhat mimics the first two decks at the Coliseum. It has 32-36 rows down low, 24 rows up above, then skyboxes over it. The last row is only 56 feet above the field. There is only one regular concourse, but it’s 65-83 feet wide. There are club seats and a separate club concourse up top, probably with no fancy lounge or restaurant. Above the suites is a rooftop deck, which can be used the same way the 49ers use theirs at Levi’s Stadium. Or it could simply provide expanded seating in the future. The roof is only 88 feet above the field, or almost 2 stories lower than the top row at Coors. There are compromises. The suites and club seats are about 20-25 feet further away from their counterparts at Coors (AT&T). Does that matter? I doubt it. To be clear, I have no idea if 360 and Wolff are pursuing anything like this. It would be a great way to go. It brings over that vertical conservation that no other ballpark in the majors save for PNC Park attempts to accomplish. If the goal is the best baseball viewing experience, I hope that this is something that the A’s-360 team is exploring. We’ll all be better off in the end if they did. I want vertical conservation fun now. Yep, this is exactly what I hope they build. This is why I’m rooting for a 32K stadium – because I want it to be two decks, packed every night, and loud. Another argument in favor of two decks – if this stadium ends up being surrounded by high-rise, $400K+ condos, those buyers don’t want to be looking at the 4th and 5th decks of a baseball stadium as the view off their balcony. They want a view of a beautiful skyline, hills, and perhaps to be able to look down into the bowl of a two-deck stadium with a beautiful green field. This two-deck stadium isn’t just what I think the A’s should do – I think it has the potential to become the baseball blueprint that 15 teams try to emulate when their current stadiums become outdated in the next 30-50 years. The people in baseball suites simply belong at the top. They don’t contribute (as much) to crowd noise, they can’t catch foul balls or home runs – they are less a part of the atmosphere. You can put them at the top in a two-deck stadium and still give them great expensive, exclusive seats…but not in a 3-4 decker. In the model ML shows above, you could even do two stories of suites, stacked on top of each other, just below the roof. I’m guessing that we won’t see a right field colonnade in the next version of a stadium sketch…because an Oakland stadium won’t need a 300 foot porch to right field to shoehorn it in front of Autumn Parkway in SJ. It’s a stronger metaphor for the suites, too. The rich should look down on the peasants from a great height. Right, one thing I don’t show is the inclusion of club level suites. 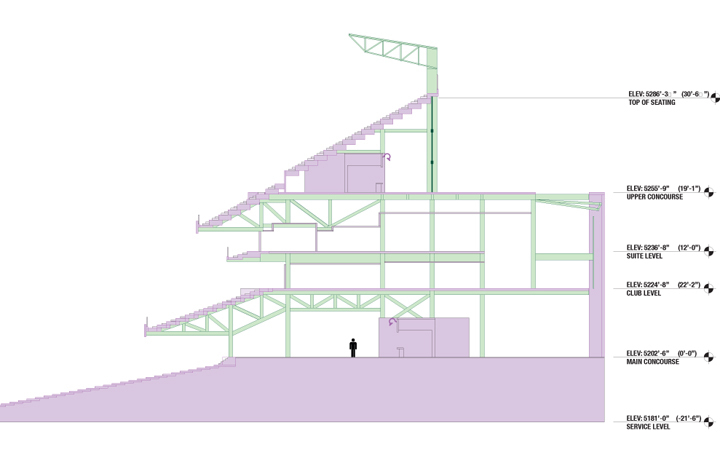 The press box would go on the suite level, with club suites to backfill demand behind the plate. That’s also similar to the Coliseum. Sounds positive, hopefully the good news continues to come. I don’t. MLB doesn’t want 32K anyway. I think it’d be closer to 38K. isn’t this what the niners tried to do with levi’s stadium? the lower bowl seating capacity is supposedly the biggest in all of the nfl the theory is that the noise at levi’s will be louder than it was at candlestick. personally would love a carp on copy of pnc park and that’s what it looked as the a’s were doing with cisco field when those first renderings came out what 4 or 5 years ago? Not sure if noise was the goal, but the Levi’s (and Phillips Arena in Atlanta’s) practice of placing all the suites on one side allows for more cantilevering of the upper deck, which puts it closer to the field. Hard to do for baseball, as putting all the suites behind, say, third base would lead to a weird look. From a team standpoint, I would definitely the second deck split in two, so as to have a “box seat” and “reserved seat” price points. The problem would be in that it would require more steps up from the concourse. I guess I have an issue with the thinking that the overhang at the Coliseum is particularly bad. Certainly those aren’t the best seats, but the top row of the lower deck at AT&T is much, much worse (as are the tops of lower decks in most other stadiums I’ve been to). There’s actually pretty minimal cantilevering/overhanging of the upper deck at Levi’s, only the front section. The Coliseum as it’s currently built wouldn’t be up to current code and ADA regulations. levi’s stadium design wise is basically the lions venue ford field but without the roof. wasn’t discussed a long time ago when the cisco field pics were released in summer of 2010 that the two tier would also cost a lot less than adding that “middle 2nd deck”? The 3rd deck is always the most expensive piece. It requires more materials and greater structural support, all for seats with diminishing returns. guys on mlb network said the a’s have the “best” fans in the game, basically said the quantity isn’t there but quality is. also said that a’s fans effect the game moreso than any other mlb team’s fans. said it’s a football atmosphere. trio on mlb network were amsinger, reynalds, and plesac. Great, we’re getting the Cardinal fan treatment. Having just been at SafeCo and Coors Field this season, and moving around to the various levels throughout the game, I concur with this analysis. Coors was a boring fan experience. Pretty building, but poor experience. An intimate setting for Oakland’s mojo would be awesome and probably sell out every night, especially if we get the local vibe represented, like Oaklandish, Chop Bar, taco bar, Linden St Brewery,….so very ripe for awesomeness. Coors always struck me as nothing but a Colorado based version of Camden Yards with the layout reversed. It was built so early in the newest era of stadiums that the idea of making the parks unique while also part of the obviously new trend hadn’t occurred to them yet. They wanted Camden Yards in Denver. And as a result they got Camden Yards in Denver, just minus the warehouse and with the addition of several thousand seats that now sit unused on all but 2 or 3 nights a year. As much as everyone hates Mt. Davis, one thing that it did do to the park was make it louder. In the item stadium days the sound just traveled out. Ironic that the one big detractor creates both a negative as well as positive aspect. I hope the architects design the new park to recreate the sound acoustics of the O.co. Interesting that Ballpark Digest is reporting that the A’s AREN’T working with 360 on the latest ballpark design for the Coliseum site. If so it’s an interesting change of direction for the A’s.